The County, under the Captaincy of Craig Buttivant, had an intensive week of coaching in Portugal during March. A group of players from each of the Junior, Colts and 1st Team were put through their paces by coaches Ian Godleman, Paul Cook and Alasdair Barr. Junior Manager - Brian Roake and Colts Manager - Brian Davies were also in attendance to ensure that the programme ran smoothly. All the players worked extremely hard on their games and we hope to see the benefits over the coming months as we try to regain the County and Colts League titles both lost last year. Team at Liphook: David Addison (Donnington Grove), Adam Birdseye (Hazlemere), Jack Bircham (Woburn), Matthew Briggs (Donnington Grove), Craig Buttivant (Gerrards Cross), Robert Christian (Beaconsfield), Matthew Haddy (Bicester), Tom Lawson (Ellesborough), Ben Smith (East Berkshire), Ashley Walton (Frilford Heath). Team at Mill Ride: David Addison (Donnington Grove), Adam Birdseye (Hazlemere), Jack Bircham (Woburn), Craig Buttivant (Gerrards Cross), Robert Christian (Beaconsfield), Ben Harwood (Hazlemere), Andrew Mason (Tadmarton Heath), Luke Rusher (Burnham Beeches), Ashley Walton (Frilford Heath). 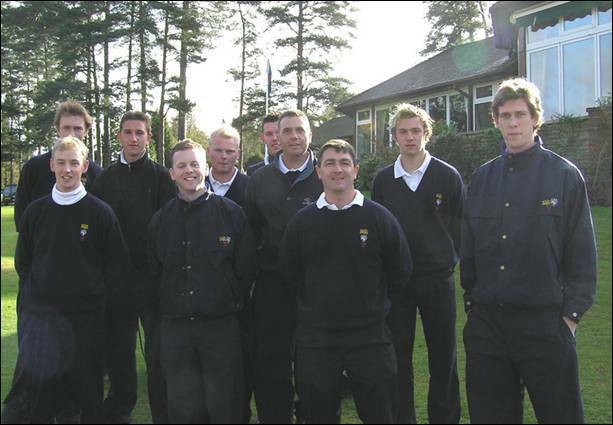 Team at Gerrards Cross: Robert Christian (Beaconsfield), Carl Corbin (Wokefield Park), Matthew Haddy (Bicester), Michael Joy (Hazlemere), Andrew Mason (Tadmarton Heath), John McNally (Stoke Park), Mark Rubber (Maidenhead). Team at Stoke Park Club: Haydn Brooks (Woburn), Carl Corbin (Wokefield Park), John Cronly (Frilford Heath), Robert Christian (Beaconsfield), David Fulcher (Woburn), Matthew Haddy (Bicester), Michael Joy (Hazlemere), Keith Leahy (Mill Ride), Andrew Mason (Tadmarton Heath), Mark Rubber (Maidenhead). 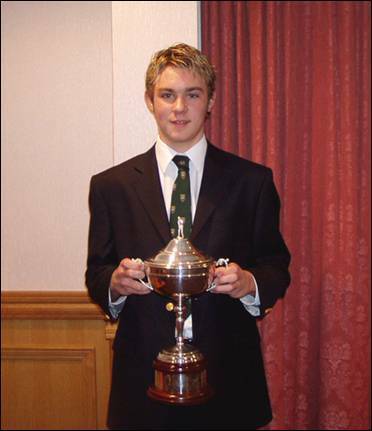 Adam Birdseye (Hazlemere) won the Boddington Trophy in 2003. 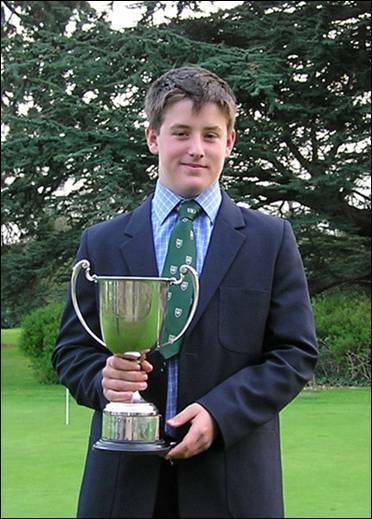 This award, given by the Honourable Company of Oxfordshire golfers is to the most improved Junior in BB&O. The Honourable Company also make a substantial donation to the County Union each year to help fund Junior golf within the Union. 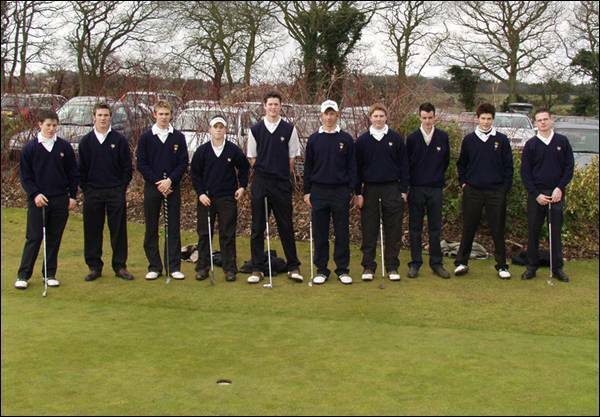 The Juniors played Hampshire and Wiltshire in a three way match at Test Valley on 7th March. Unfortunately due to very poor weather conditions the matches had to be abandoned after a few holes. Team at Test Valley: Adam Birdseye (Hazlemere), Laurence Eltham (Goring & Streatley), Mark Hall (Oxford City), Robert Hart (Stoke Park), Adam Hinkins (Chiltern Forest), William Roebuck (Mentmore), Daniel Taylor (Woburn), Chris Tellett (Woburn), Lee Wanklyn (Sand Martins), Adam Wootton (Oxford City). Team at Beaconsfield: Adam Birdseye (Hazlemere), Haydn Brooks (Woburn), Laurence Eltham (Goring & Streatley), Robert Hart (Stoke Park), Ben Harwood (Hazlemere), Adam Hinkins (Chiltern Forest), John McNally (Stoke Park), Matthew Rendell (Reading), Craig Taylor (Woburn), Daniel Taylor (Woburn). 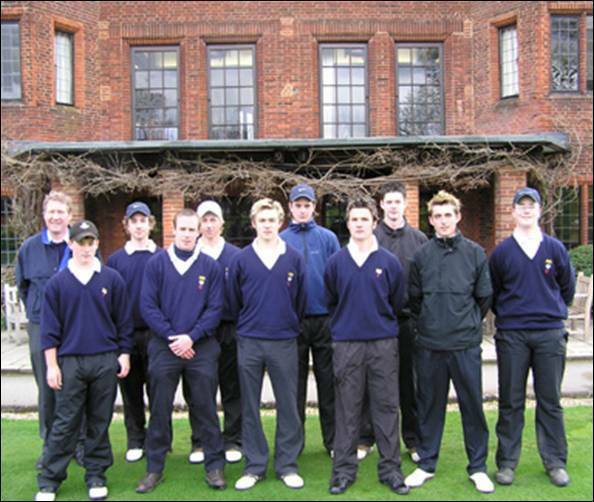 Team at Hazlemere: Sandy Bolton (Hinksey Heights), James Brockington (Studley Wood), Lloyd Cassidy (Studley Wood), Alister Haynes (Studley Wood), Tyrrell Hatton (Beaconsfield), Matthew Johnson (Chipping Norton), Alex Land (Harleyford), Steve O’Connor (Tadmarton Heath), Nick Robinson (East Berkshire), Ben Stewart (Burford). Team at Sheerness: Jim Cameron (Harleyford), David Doodson (Temple), Duncan Forbes (Sonning), Nigel Franklin (Buckingham), John Gill (Sonning), Robert Gill (Gerrards Cross), Ian Hunter (Maidenhead), David Shaw (Goring & Streatley), Tommy Wells (Burnham Beeches), Alastair Wright (Goring & Streatley). Team at Beaconsfield: Peter Batchelor (Woburn), Tim Clutterbuck (Beaconsfield), David Doodson (Temple), Duncan Forbes (Sonning), Robert Gill (Gerrards Cross), Mervin Foulds (Maidenhead), Ian Hunter (Maidenhead), Anthony Parsons (Denham), David Shaw (Goring & Streatley), Alastair Wright (Goring & Streatley). 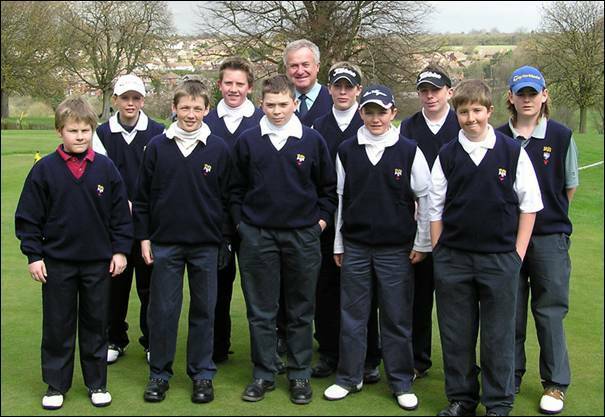 Played at Buckinghamshire Golf Club on Tuesday 13th April 2004 62 Boys aged 18 and under contested the Championship on a wonderfully prepared course playing over 6,800 yards. With a Par of 72 and Standard Scratch of 73 the quality of golf in the morning was excellent with defending Champion Haydn Brooks (Woburn) heading the field with a brilliant 4 under par 68. He led four players on 74 including brothers Daniel and Craig Taylor also from Woburn, alongside Lee Frame (Donnington Valley) and Adam Birdseye (Hazlemere). Another 4 players were tied at 2 over par 75 but it looked as if the others were too far back to worry the leader in the afternoon. As usual, scoring improved in the afternoon and more than half the field played to their handicaps or better. Haydn Brooks got off to a bad start in the afternoon with a double bogey at his first hole but he quickly settled down and after 12 holes was back to level par. Meanwhile Daniel Taylor reached the turn in level par and after 16 had got to three under which put him 1 under for the day but still 2 shots behind the leader. Brooks after a couple of poor holes finished in style with a birdie 2 at the last to take the title by 3 shots. 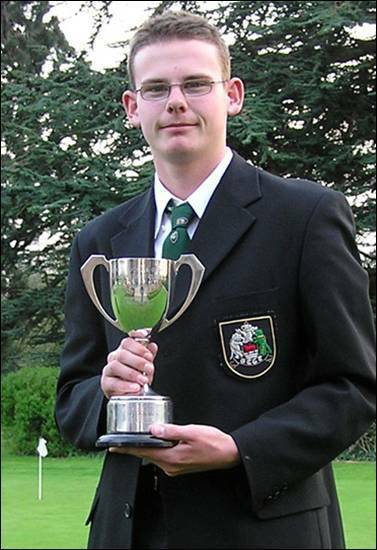 Roberts Hart (Stoke Park) played consistently to win the Under 16’s Trophy on countback from Lee Frame (Donnington Valley). 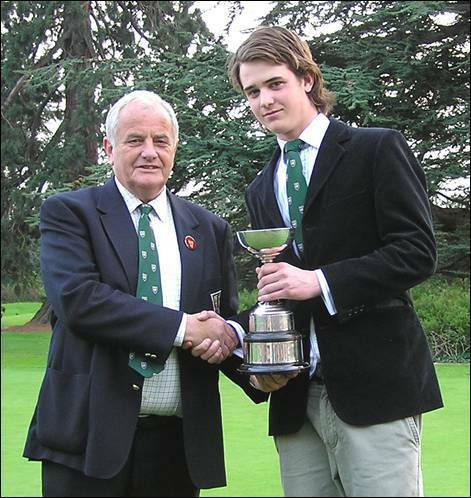 Mark Hall showed a welcome return to form with two excellent rounds to take the Handicap Trophy from Ben Ratcliffe (Gerrards Cross) who, as an invitee, was not eligible to take the main prize. Once again the Juniors put some of their elders to shame by remaining for the presentation and applauding the winning players. 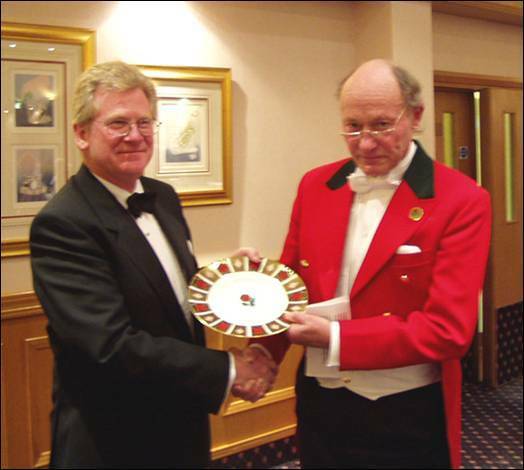 Paul Fisher presents Flackwell Heath Golf Club’s Captain, Roger Warren with a Centenary Plate. The Annual Council Meeting of the County Union took place on 17th March at Maidenhead Golf Club. The Council comprises the Secretary or Manager of each of the 122 affiliated clubs, together with provision for each club to nominate a ‘second representative’ who may attend. A very good attendance gathered to go though the business of the meeting, with the President’s Report followed by written reports from the Captain and Team Managers. 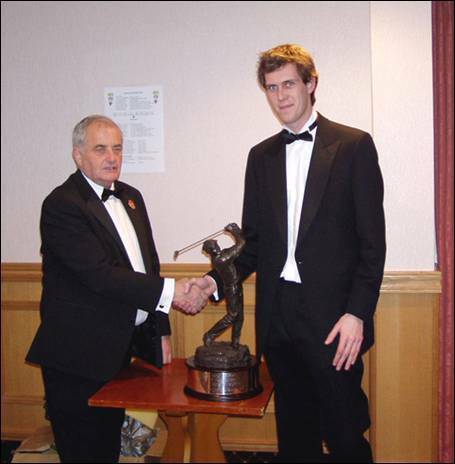 The Finance report was presented by the County Secretary/Treasurer and he advised that the English Golf Union fee for 2005 would rise to £5.50 per member from £5.15. At that point the levy of £2.00 per head for the purchase of Woodhall Spa will come off reducing the per capita to £3.50. The BB&O fee would rise to £4.00 for 2005 as agreed at the half Year Council Meeting October 2003. In accordance with the Notice sent to all affiliated clubs in November 2003. 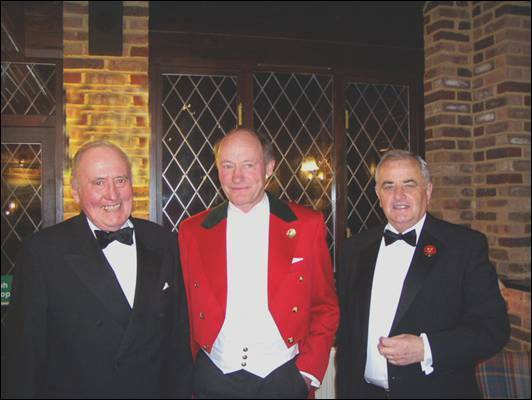 Mr C Tennant (Reading) was re-elected for a further two years and Mr A Mackie (East Berkshire), Mr M Foulds (Maidenhead) and Mr G Jones (Castle Royle) were unanimously elected to the Executive Committee.